Does the floor look dull, lack finish, dinghy, smeary or cloudy? Are there patches of lighter wood appearing either under area rugs, or where they once were? Or patches in front of windows that experience strong or direct sun? Do your traffic lanes seem dull, worn or thin? Is there blackness in the grain where the finish has worn off? Can you see the raw wood, especially at points of entry from grit and sand from the outside grounds? Do you have small patches of finish that has peeled, like a sunburn? Do you see scratches from bar stools, chairs, or from dragging furniture across the hardwood? Do you have splinters, holes, missing pieces, soft mushy damaged areas or “sponge-like” or sink when you stand on them? Do you know if you have had bug infestation that has burrowed in the wood causing an appearance change? Does your nail, running across the scratch “stop” and get stuck in the scratch? Instead of a scratch, are there indentations or “divots” where the wood has depressed as a result of something being drug across it? Does the hardwood show pet nail scratch damage, either larger scratches from bigger pets or finite scratches from smaller pets? Do you see light green, yellow or dark marks (dark explained below)? Do you have white or cloudy areas say around water sources such as dishwashers, sinks, bathrooms, near windows, doors, etc? Are there spills or round black marks or areas appearing dark, under area rugs, near walls, in front of points of entry, from ceiling leaks, near where house plants were over watered? are the boards cupped- a condition where the boards may have swelled, appearing higher in the middle of the board, so your foot trips up as you rub it across the board surfaces (each board in the affected area may do this), where they look swollen and too big for area they are installed in to. are the board ends warped, curled or distorted? are the boards buckling, and pulling away from the subfloor? Is there a definite “smeariness” to the floor, perhaps a sticky residue that is noisy when you walk across the floor with your shoe? Are there tiny round divots, the size of a pencil eraser randomly all over the floors, particularly in traffic lanes? Do you have a waffle-like spongy residue left from a pad that decomposed under your area rug, black marks near the tack-less strips once a carpet is torn out? Or is the finish once the carpet has been removed appear to be thin, or missing? Any of these above-mentioned scenarios are considered problems, damage, residues or oxidation requiring professional attention. While a few of them may be handled by a DIY effort, most need skilled craftsmen with specialized equipment, not even a handyman or general contractor is equipped to do. And to correct most of these problems be prepared for a sanding & refinishing project. Most Problems, even in isolated areas cannot be corrected within the area, the procedures must be expanded to include the entire surface, in and through not only the room affected, but expanded to include other rooms which all run into one another. At best, you can isolate the work if there is a “natural break” say from 1 board to the next if transitions or wood in other rooms run diagonally, or something is done to create “natural breaks’. Isn’t There Something You Can Do To Just “Buff It Up A Little Bit”? Regretfully, rarely is there a solution where we can just buff it up a little bit. Nine 1/2 times out of 10 the answer is plain & simply NO! Buffing of floors as a solution is almost never appropriate because of the way floors are finished, as opposed as to how they were finished years ago. Today’s floors have a surface finish, usually a Polyurethane. The buffing of paste wax is not compatible for a Polyurethane Finished Floor, where the coat lays on top of the wood. Buffing wax is only suitable where the finish absorbs into the wood, so wax on top of a completely sealed surface does absolutely nothing. Again, that would be most likely not. Boards fixed & finished, patches, or areas will look absolutely different from the remainder of the floor. First off wood over time changes color, so the chances of staining to match are extremely difficult. Any time you spot apply to finish it will look different from the surrounding floor- so much so it will look like paint spots on an older painted surface, or will look like a shiny patch compared to the overall floor. The correct procedure is to do the spot repairs, then sand the floor down, so it is all uniform, then stain, seal & finish it all together to achieve a continuous uniform finish. An exception to this might be if you have extra boards or other boards (say from in a closet) that you can insert to replace the damaged ones. Hopefully, the damage does not cross diagonally involving several boards. Also, hopefully, the donor board is close in color and finish appearance that it will blend in and be less noticeable than the damaged boards. 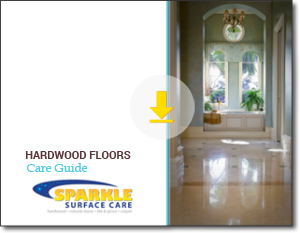 Download our free Hardwood Floors Care Guide. It’s a great resource full of tips and info. You will want to keep it handy. Mostly what we use is Poly Whey, a natural based coating system, and water-based stains. They don’t have the nasty VOC issues. There is little to no smell. However, you may notice a mild smell accentuated, especially if you have gas in your home. It may be more concentrated around those appliances.